Yes! Bagheera, the famous character from Rudyard Kipling’s Jungle Book has made a surprise entry into my life, filled me with excitement and joy that I felt as a kid while watching the Jungle Book movie. It was more than a thrill to see a black panther and a leopard together at the time of moonlight safari. I still remember the first sighting with every detail. On 1st February 2015 we started our moonlight safari with MS Tracy, who was the only guest on that day. We picked her up from the tree house and took a right turn heading towards our bungalow. As usual I started looking for night jars which can be regularly seen nearby coffee plantation and neighboring clearings. Suddenly, I saw pair of eyes right next to the crocodile bark tree which stand alone in this patch. To our surprise another pair of eyes glittered next to the first pair of eyes. We turned the Gypsy and tried to cover little bit distance towards these glittering pairs of eyes and we were shocked. There was a pair of leopards standing in front of us. One of them had a normal yellow coat with black spots and another one was jet black. Then what we spent almost an hour to capture these beautiful creatures in our cameras. The one with regular yellow coat seemed to be very shy and till disappeared within no time. But the black one gave us ample time to try our skills. Capturing a jet black leopard in spot light hardly focusing light till the creature was not so simple. But with help of our skillful driver who managed to drive vehicle in this difficult terrain without disturbing an animal we got some good snaps. Then for whole month of February one or the other leopard was sighted in and around the resort property area. On 3rd of March 2015 we saw this pair during nature walk. This time I got snap of the leopard with regular coat, as it got scared and climbed up the tree, but the black beauty Bagheera ran away in the bushes. On 20th March 2015, once again Bagheera made returned to the area with really amazing entry. When were about to begin out moonlight safari, languor monkeys brooked alarm call right from the peepal tree adjacent to the temple nearby the reception area. I was fixing the spotlight and one of the guests was standing in Gypsy with me. This time I was quite sure where to look out for the animal whose presence was scaring the langoors roosting on canopy of peepal tree. I turned the spotlight right on the open patch of grass near the peepal tree and we were stunned to see a black panther sitting calmly right next to the road. Within a minute or so, rest everybody hopped in the vehicle and we headed to catch the glimpse of Bagheera. We saw it from really close distance but excited expressions of people in the vehicle made Bagheera to seek shelter in the bushes. We observed this animal almost for 20 minutes and then we headed towards the lake hoping that by that time Bagheera will again come back in an open patch. But when we came back to the same spot we saw our Bagheera simply laying down comfortably into the dried bushes next to the coffee plantation. When I came back to the bungalow I was still looking for Bagheera into the pitched dark jungle. 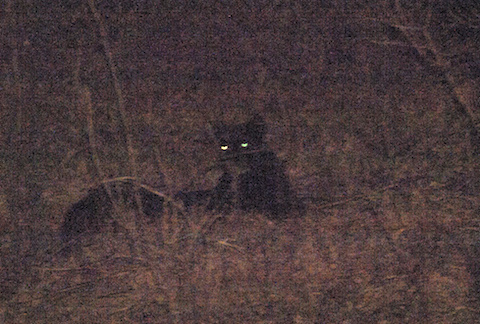 I was glad to see Bagheera laying down in the bush on other side of the road next to the bungalow. 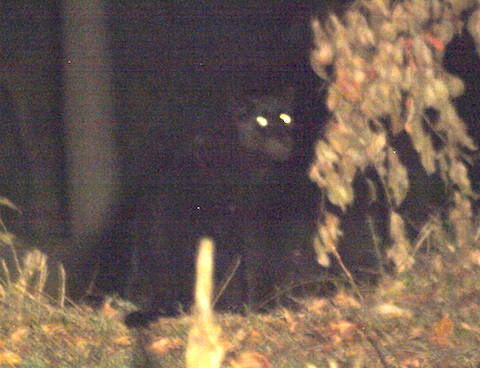 I can’t describe the feeling to see a black panther staying so close. Whole night I kept coming and kept seeing this beautiful animal. At 5am next morning one of the spotted deer revealed Bagheera’s presence and then Bagheera left the spot. 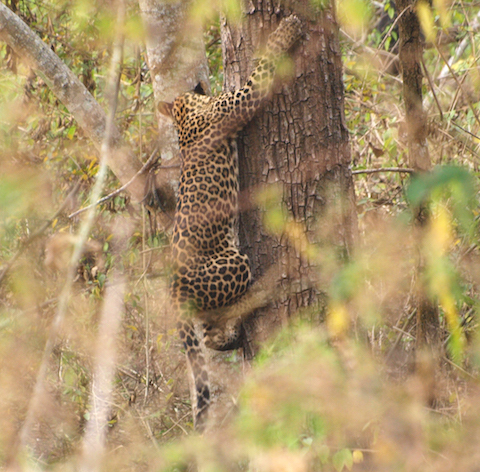 Then at 8.00am, same pair of leopards, Bagheera and fallow leopard mate was sighted by guests in the tree house. You are also welcome to join our play of hide and seek with Bagheera, the black beauty.